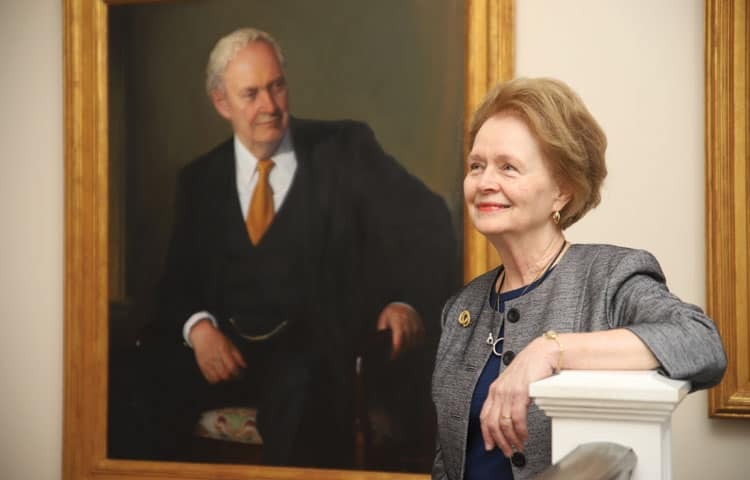 Mary Ellen Bork is the wife of the late Judge Robert Bork and has served on the college’s Advisory Board for nearly 20 years. Mrs. Bork is a freelance writer and lecturer on issues of Catholic life and culture. Over the years, she has been an advocate for the pro-life movement, promoting Catholic culture through groups such as the John Carroll Society, Imago Dei (Theology of the Body), The Susan B. Anthony List, and the Catholic Campaign for America. Her articles have appeared in national papers, including the National Catholic Register and The Washington Times. 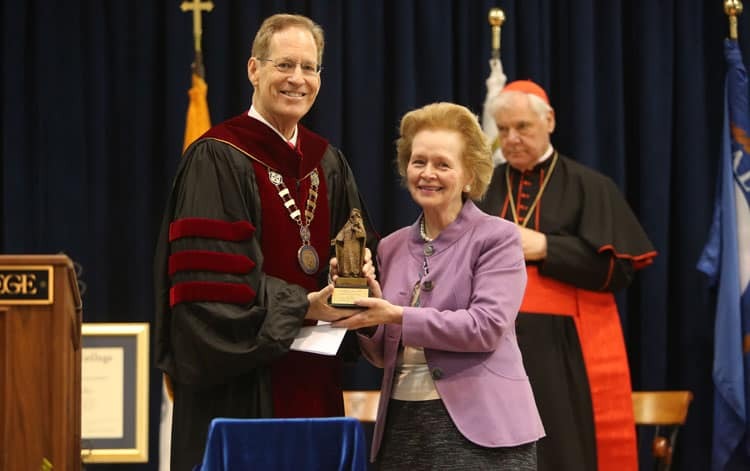 In 2017, Christendom College awarded her the St. Catherine of Siena Award for Distinguished Service to the Church & Christendom College. The following is an interview with her from the Winter 2018 issue of Instaurare. Read more from the issue here! How is Christendom the answer to the cultural crisis we see around us? I think it’s one of the key solutions. At Christendom, the young people are being formed in their intellectual and moral life, but also in their spiritual life—and they do it just fabulously. We’re at a point in our culture where individuals—and especially if they’re radicalized—want to make up their own values, their own morality, and then impose it. If that turns out to be a political party too, they want to impose that on others. It’s certainly not the traditional morality of the Judeo-Christian tradition, and after the Kavanaugh hearings, we all saw a new low in our culture from our elected representatives (not all of them, of course). I have this discussion all the time with people, and a lot of people say, “Well, aren’t you hopeful?” My husband, Bob, really thought that the last bastion of moral order was really the Roman Catholic Church. As of this summer, we know we have a lot of problems with the Church and its leadership, so it just shows the power of the culture to even get into the Church. Young people today are facing a culture that is disintegrating. All of this just constantly reinforces the need for Christendom and what it stands for, which is classical Christian values. It is needed more than ever. Christendom gives a philosophically and theologically deep education, and it happens in a spiritual community. It’s not just abstract ideas. These young people are living it every day in their communal life, but also in the liturgy. God is informing these young people as they go through their studies, and all the things they have to do, all the papers they have to write. And that will stay with them no matter where they go afterward. They need that experience to be able to withstand what they’re going to meet when they get out. They’ll be able to hand on what they have learned and be evangelizers. Is there a particular moment or memory in your time spent with the faculty or staff of Christendom College that stands out to you? I was just recently visiting the college for the groundbreaking for the new chapel. While there, I was very struck when Dr. O’Donnell mentioned in his remarks that there are so many things in our culture that are being torn down, and here we are building this thing of beauty on the edge of the Shenandoah. I just thought that is really countercultural. And of course, Christendom isn’t just doing this when they are building a chapel, they’re doing it on a daily basis there. 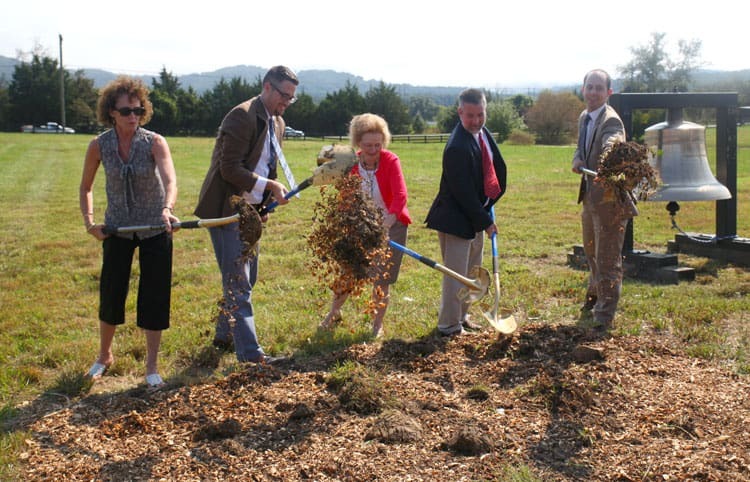 Bork (center) was a part of Christendom’s groundbreaking for its new chapel. What was it about Christendom that made you decide: “This is something I want to support”? It’s an institution with excellent teachers that is providing a very in-depth Catholic education. There are very few places doing that today. I hope it continues to grow and continues to attract students from all over the world. You recently set up a scholarship for the humanities in honor of your husband. Can you tell us the inspiration behind it? We all saw what happened in the Kavanaugh hearings. It was hysteria. All of these false ideologies are being led now by younger people, and they don’t have any intellectual formation. They’re kind of making it up as they go along, and that’s very dangerous. We need now more than ever to have young people who are able to think on their feet and explain, “No, this is wrong,” and analyze it because they understand the tradition out of which they’ve come. The humanities are really where faith and reason come together beautifully. Today we need to be able to explain our faith to a very confused world, and so the humanities are crucial. There is a Catholic approach to truth and to morality, and it’s terribly important that we pass that on. It isn’t happening in a lot of supposedly Catholic institutions, so I’m very happy that Christendom is doing that, and doing it here in the Washington, D.C., area. Bork receiving Christendom’s St. Catherine of Siena Award in 2017. Is there anything about Christendom College that has surprised you in the past years? The growth. It is tremendous. It shows that people are really looking for something solid, and when they go and visit, and hear about it, and hear about the course offerings, I think they see that this is really what they want for their children, if they’re serious about the faith.